We’re big fans of taste-testing and comparing all the city has to offer in a specific food category and the annual Wingapalooza at INTRUST Bank Arena in downtown Wichita makes this tough job a lot easier (hey, somebody has to do it for our readers!). We can move from booth to booth on the main floor of INTRUST Bank Arena and try wings from some of our favorite restaurants while discovering new chefs. 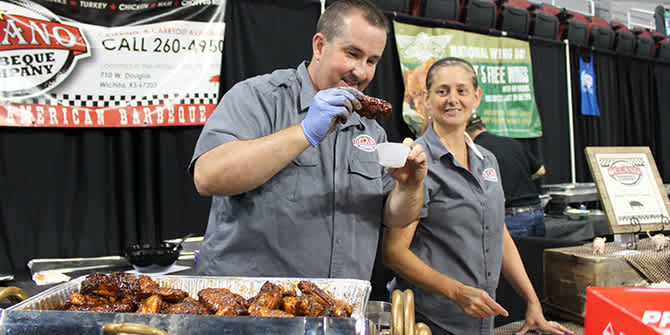 For the third straight year, SMG and INTRUST Bank Arena will host this all-you-can-eat wing fling. Wingapalooza 2017 is set for 11 a.m. to 3 p.m. Saturday, Aug. 12 and costs $20 per person with advance ticket purchase. Our preferred method of attack is to visit three or four booths then find a high-top table in the middle of the arena floor to start sampling. We continue that process until we’ve tried them all and with more than 20 local restaurants and chefs participating you’ll find every style of wing – saucy, dry, hot, sweet and flavors you never considered! Participating restaurants and chefs are supplied with wings – more than 40,000 total – that they can season and cook in any manner to showcase their culinary skills. Two award categories are presented at the end of the event: a People’s Choice Award dubbed “Lord of the Wings” and a Judge’s Choice Award, with first, second and third place awarded in each category. You can sample as many wings a you like – try our method of comparing each chef’s recipe or settle on a favorite and eat until you’re full. There are vegetables and dipping sauces, but no other food is served. There’s also a beer garden, beverage concessions and an in-house DJ providing music. New entertainment this year: a wing-eating contest featuring first responders among fire, police and sheriff’s deputies. The inaugural Wingapalooza in 2015 sold out and last year’s event drew 1,300 wing fans. This year, the event price is returning to $20 in advance or $25 at the door, and organizers expect to sell all 2,000 tickets. They recommend buying in advance online at selectaseat.com, by phone at 855-755-SEAT or in person at the Select-A-Seat Box Office at INTRUST Bank Arena. Plan now to attend Wingapalooza and discover the diverse flavors of Wichita’s food scene.